Ingredients: Naked Nuggets are freshly grilled, all natural white meat chicken (no breading, no fillers, no gluten, no trans fats, and no frying). Our ingredients are simple – Boneless Skinless White Meat Chicken, Potato Starch (to maintain moisture), Salt, and Spices (White Pepper, Celery, Marjoram, Basil, and Garlic Powder). Ingredients: Simple Sliders are freshly grilled, all natural white meat chicken (no breading, no fillers, no gluten, no trans fats, and no frying). Our ingredients are simple – Boneless Skinless White Meat Chicken, Water, Olive Oil, Parmesan Cheese (Pasteurized Milk, Salt, Cheese Culture, Enzymes), Potato Starch, Sea Salt and Black Pepper. 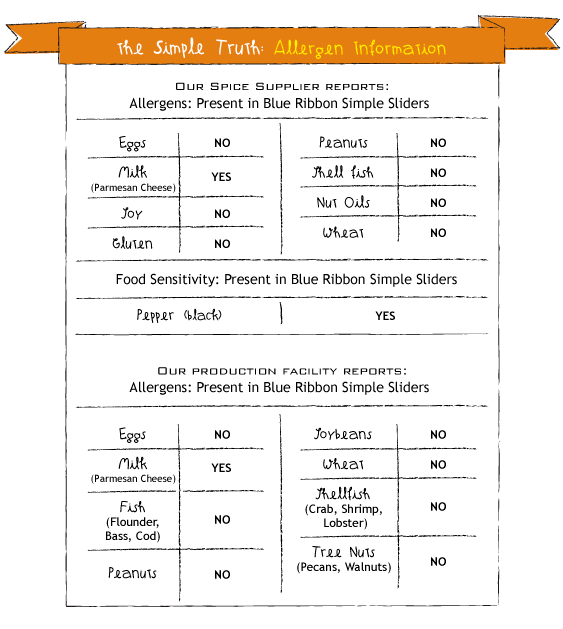 [Our production facility] is in compliance with the food Allergen Labeling and Consumer Act of 2004 (FALCPA). In that manufacturers are required to identify the presence of ingredients that contain life threatening allergens: i.e. Milk, Eggs, Shellfish, Fish, Tree Nuts, Peanuts, Wheat or Soybeans in common terminology on retail labels. [Our facility] has a program which they use to identify allergens as they are received in the plant and track ingredients through the process and products. They have the appropriate controls and sanitation for handling allergens to prevent accidental or cross contamination in our plant. They do not process or use any products that contain tree or peanut derivatives. Naked Nuggets and Simple Sliders take a novel category-changing approach to prepared chicken – they are grilled, not breaded or fried – just grilled, 100% natural white meat chicken and perfect seasoning. So, they are gluten free and contain less fat than traditional fried chicken nuggets and have more protein and less carbs per serving as well. You can’t beat them! A healthy dinner for the whole family! 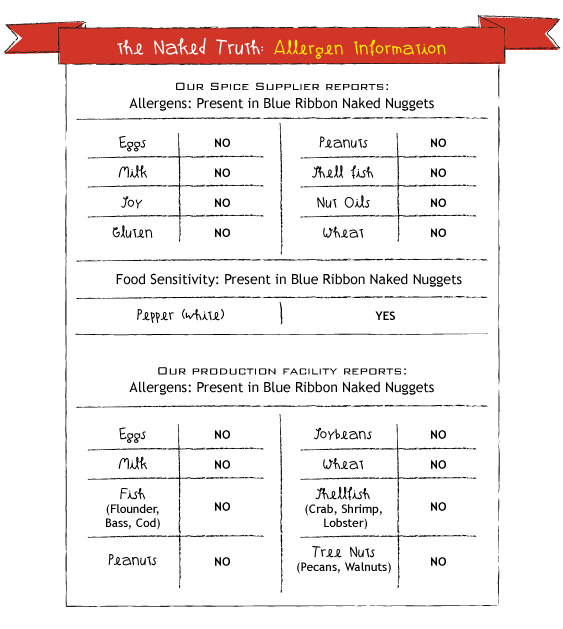 Naked Nuggets are also Child Nutrition Labeled- seven 0.46 oz Grilled Seasoned Natural Chicken Nuggets provide 2.5 Equivalent Meat for Child Nutrition Meal Pattern Requirements.